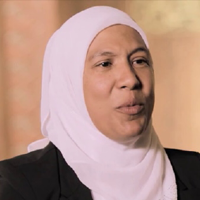 Lobna Mulla works for the Muslim American Society (MAS) as their National Tarbiya Director. She has been working with the youth for the past 15 years in various capacities such as providing mentorship, leading study circles and giving lectures nationwide. She is the creator of the YouTube channel Double Shot Mocha Productions, where she hopes to entertain and promote social awareness through humor.